It took perspective to see the Detroit Pistons the way Bryan Burwell did in the late 1980s. The Bad Boys hip-checked the small of Larry Bird’s back, clotheslined Michael Jordan’s esophagus and tormented NBA commissioner David Stern with their bullying style of play. The world hated the Pistons and the Pistons hated the world. The Bad Boys enthusiastically played the role of goons. Burwell, though, demanded that they explain themselves in a more nuanced and accurate narrative. “You know how players have their go-to moves? We had our go-to answers,” says Isiah Thomas now, remembering Burwell trudging into the home locker room in Auburn Hills, Michigan, nearly 30 years ago and listening to their homogenized, rehearsed words before cornering them in private. He died on Dec. 4, 2014 — two years ago this week – after a swift fight with melanoma. Fiercely private about his illness, he kept his diagnosis from almost everyone but immediate family and a few friends. Told his condition was terminal in late September 2014, he died in less than 10 weeks. He was 59. Beyond his wife of 30 years, Dawnn, and his daughter Victoria, he is survived by the press box. Burwell was, quite simply, one of the seminal contributors to black sports journalism. He worked at eight newspapers, from New York’s Newsday to the Detroit News to USA Today to his final 12 years at the St. Louis Post-Dispatch, while pioneering the balancing act of sports writer and multimedia personality. Blessed with a distinctive baritone, he perfectly enunciated Every. Single. Word, while holding gigs at Real Sports, Inside The NFL, on TNT as a sideline reporter and The Sporting News. He couldn’t sing, but that broadcast baritone made him the Barry White of sports writing. 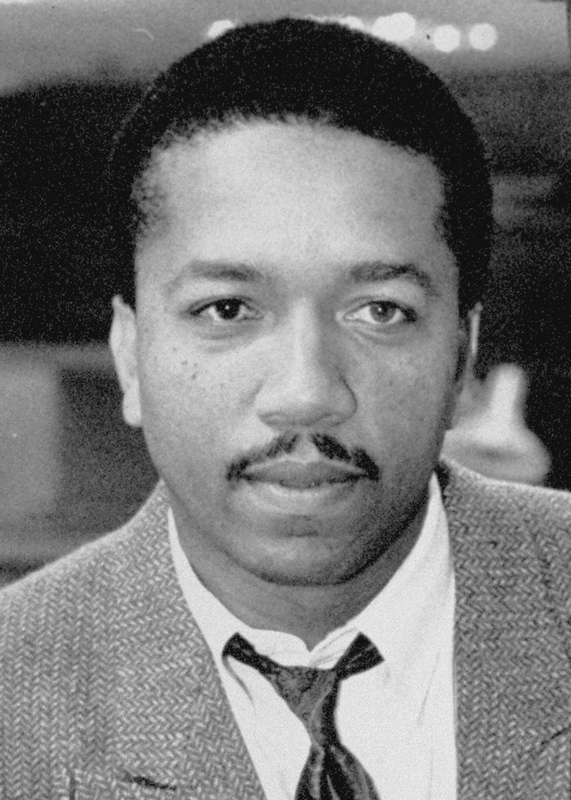 Bryan Burwell while on staff of the New York Daily News. Burwell approached issues of race and class head-on and mentored an entire generation of young journalists, many of whom needed to see someone who looked liked them rise to the pinnacle of their profession. 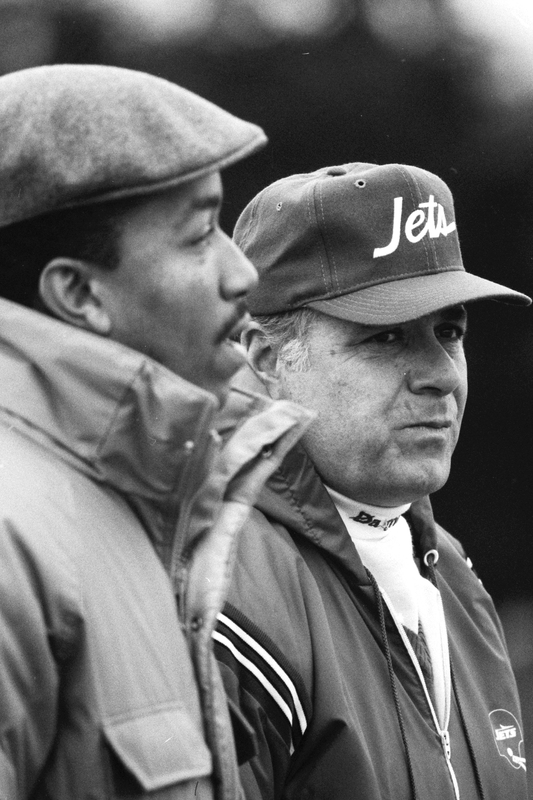 He reached it in 1992, when USA Today plucked him from Detroit to be its top sports columnist. At the time, before the internet, before ESPN launched a website, newspapers still were king. Burwell’s voice resonated loudest and farthest. USA Today had more than 2 million Monday-through-Friday subscribers and readers across the globe. He held the job for five years. Part of a high-profile group of black writers who helped desegregate American sports media rooms in the late 1970s and ’80s, Burwell, Ralph Wiley, William Rhoden, Roy Johnson and Michael Wilbon knocked down the doors that Stephen A. Smith, Stuart Scott, Michael Smith and others walked through to prominence. 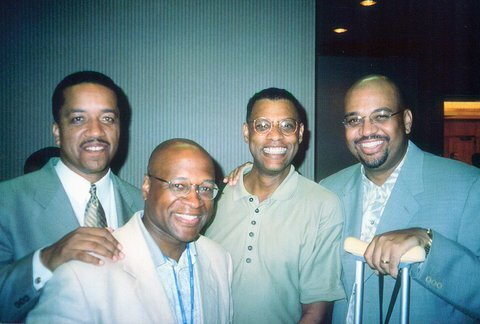 Taken at 1998 NABJ Convention In DC after honoring pioneering sports writer Sam Lacy. From L to R: Bryan Burwell, Roy Johnson, Ralph Wiley and Michael Wilbon. His social conscience made him go from the Super Bowl in Pasadena, California, in 1992 to South Central Los Angeles post-Rodney King. If the moment required, Burwell could also be extremely personal. In 1998, he recounted picking up his daughter Victoria, then 9, and her friend from a dance rehearsal in a just-purchased Ford Expedition (the vanity plate read “SPTSPGE”) before getting pulled over. “My daughter is crying,” he wrote of that night in Fairfax, Virginia, when one officer was soon joined by another four squad cars to essentially write a speeding ticket while threatening to arrest him. “She thinks we are going to jail. I am seething inside, because this is happening for no reason. Burwell filed a complaint, but no disciplinary action was taken against the officer after an internal investigation. DeWayne Wickham, now the dean of the School of Global Journalism and Communication at Morgan State University, recalls Burwell “as a race man who never shied away from taking on a cause of racial justice.” Wickham recounted an incident from 1977 when he was agitating for greater racial diversity at The Baltimore Sun. Burwell “was still on probation when I organized a petition drive to pressure the paper’s publisher, Donald Patterson, to push the papers’ top editors to hire a black columnist, editorial writer, foreign and national reporters. There were no blacks in any of these positions. Bryan Ellis Burwell was born on Aug. 4, 1955, to Harold and Olivia Burwell, a middle-class Northeast Washington family who moved to Lanham, Maryland, during Burwell’s formative years. His father had served in Germany during World War II, and for 22 years worked as a homicide and robbery detective in the District. Harold’s first wife, Jane, died 11 days after giving birth to Burwell’s older sister, Carol Ann. Olivia was Jane Burwell’s best friend and had promised to look after the little girl and her father once she was gone. Within months, their friendship turned into marriage and two more children. They were married for 50 years and today lie buried next to one another in Arlington National Cemetery. The coach happened to have a couple of applications in his car, and by the next fall Virginia State had a new triple- and long-jumper — and a budding sports writer. The Richmond Times-Dispatch gave Burwell an internship between his junior and senior years at Virginia State, kick-starting a rapid ascent in the business — to The Baltimore Sun, the old Washington Star, Newsday and the Daily News in New York and, finally, Detroit, to his first columnist job. Daily News sportswriter Bryan Burwell really telling Joe Walton what’s wrong with his game plan. The Bad Boys and the Fab Five in Motown. Ben Johnson’s syringes in Seoul. Cathy Freeman’s kick in Sydney. Burwell was one of the first national columnists to call for Bob Knight’s job as the legendary coach imploded at Indiana. He got Jordan to confess to concocting a story about LaBradford Smith disrespecting him in college, saying he had made up the story to give him ammunition going forward. It became part of the Michael Jordan canon, how he invented enemies for motivation. The two had met at a National Association of Black Journalists get-together. She worked as an NBC radio producer. She teased Burwell that so many “Brians” flirted with her at the convention, she was unsure which one would show up at her door the night she agreed to have dinner with him. Burwell delivered for all his employers. He also lavishly spent their money. By the early 1990s, the Gannett Corp.’s 1982 gamble on USA Today finally began to show annual profits in the millions. Beyond a six-figure salary befitting one of the nation’s most prominent columnists, Burwell took advantage when he left Detroit, signing a deal in which he guaranteed himself annual trips to the Pro Bowl in Hawaii, the Olympics abroad and an unusual vacation package of between eight and nine weeks a year. He lived large on the road and knew of all the perks. “His expenses were kind of on the high side,” Dawnn admitted. Laid off in the late 1990s, Burwell found refuge in television for a while — including a stint on HBO’s Inside the NFL and Real Sports with Bryant Gumbel. Burwell revealed a paternal side in his writings and relationships the last decade of his life, educating and enlightening some of the young knuckleheads he covered and mentored. 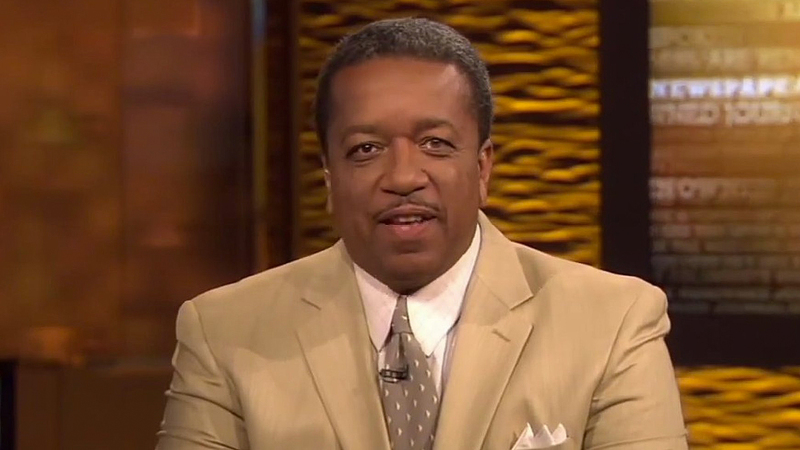 Bryan Burwell on an episode of ESPN’s The Sports Reporters. Burwell recognized he could go beyond the box score in his column and speak to a generation in need of guidance. That included being a great teammate. Bernie Miklasz, a Post-Dispatch columnist for three decades, acknowledged that “all columnists at the same paper have a professional rivalry, whether they want to admit or not,” and Burwell and Micklasz had their rows. “But through everything this is the kind of guy he really was,” Miklasz said, divulging one memorable night at a Cardinals playoff game in 2011. “I’m struggling. I’m going to be about 10 minutes late,” Miklasz replied. So Burwell got up from his laptop. Wandered casually around the press room. Spoke to friends. Sat down, slowly read his column through and waited so that he could file his story at the exact time that Miklasz turned his in. At the end of September 2014, Burwell began to complain of stomach pain. Two rounds of testing later, an oncologist delivered the news: Stage 4 melanoma. Burwell’s weight began dropping rapidly and he had less and less energy. He struggled to stay lucid at football games in September and October. Dawnn Burwell began the process of saying goodbye to the man who once promised her he would be famous. Dec. 4, 2014, came suddenly. Burwell had rebounded for two straight days. Then he stopped eating. The doctor told his wife that his liver was shutting down, that it was just a matter of time.